Ali Mufuruki has climbed Kilimanjaro four times in the past 20 years. The changes were subtle, like everyone, the millionaire was there to climb the mountain not to count how many elephant tracks he saw or note exactly what tree stood where. But the mountain has ‘vastly’ changed over the past two decades, says Mufuruki, the founder of Infotech Investment Group. 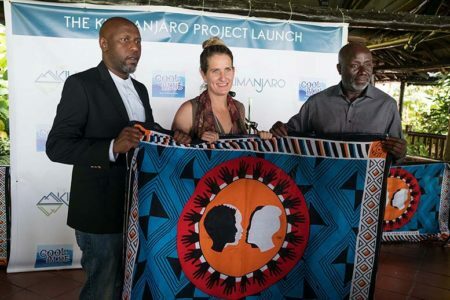 Mufuruki is part of the Kilimanjaro Project — dubbed one of the most ambitious art installation projects seen on the African continent in years — that is being spearheaded by Dar’s own Sarah Scott. Using Kilimanjaro as a ‘clear indicator’ rapidly changing climates and environmental degradation the project hopes to raise awareness that will inspire sustainable behavioral change and have a positive impact on the Kilimanjaro region for future generations. Part of their creative plan is to literally ‘go tell it on the mountain’ in 2018 by laying six khanga fabric designs up the six hiking trails of the mountain, each khanga carrying a different message around the project’s core themes: reforestation, waste management, conservation, water stewardship, and renewable energy. In addition to the art, there will be education campaigns, planting a million trees, and many more collaborations are still in the works. Have an idea you think the Kilimanjaro Project should know about — get in touch via their website at the link below. You can check out more details on the Kilimanjaro Project website.